Have you ever wanted to get information off an old Windows PC internal hard drive or just a dead computer? Maybe you have a dead Apple iMac G5, G4, or G3 and need to recover the data off the hard drive. Have you ever wanted to be able to install a new larger hard drive in your notebook computer, MacBook, MacBook Pro, or other Intel-based iMacs, or a desktop PC and do it quickly, with all the drivers, and software intact? Well, I’ve got the answer for you. Here is a cool device from Apricorn that makes it easy to plug in any new or used internal hard drive from a laptop or desktop (Mac or PC), to any external USB port on another Apple MAC or a Microsoft OS PC. 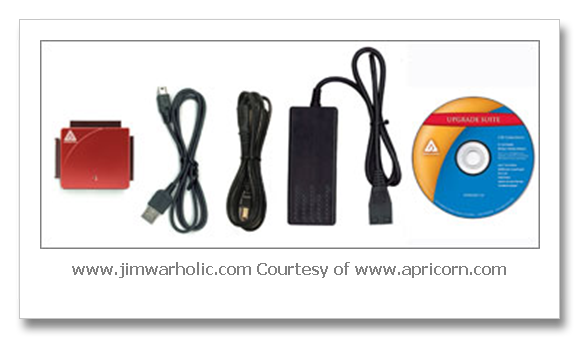 Apricorn includes both the DriveWire hard drive adapter hardware, with AC power adapter, cables, and USB cable, and software to be able to clone virtually any PATA/IDE or SATA, 2.5 or 3.5 inch, hard disk drives. The DriveWire provides a hi-speed USB 2.0 interface to: SATA, 40 pin PATA/IDE, and 44 pin PATA/IDE. I have used this universal hard drive plug-in adapter quite extensively myself for all types of applications. I have cloned Apple hard drives, tested old parallel IDE disk drives, used it to backup old computer systems, recovered files off a bad PC, and used it as an external connection for a spare hard drive for both PC and Mac computers. People have used it to quickly backup their system on an old hard drive and then placed that backup into a secure fire safe, not to be touched unless all else fails. The HD adapter has been a lifesaver for me. I don’t like to touch a computer system unless I have a backup to begin with. You do not need to install any backup software or other special device drivers if you are just plugging in various hard drives. Follow the simple instructions and make sure to set your IDE PATA hard drives only, to “Master mode” (not cable select) with the jumper setting on the hard drive, and you are set to go. Note, master mode is a jumper setting that only applies to 3.5″ PATA hard drives and determines which hard drive is the main device on the ATA bus. Most newer PC Bios systems and motherboards utilized cable select mode jumper settings on the hard drives to automatically identify which drive is the primary and which drive is the secondary based on cable hookup. In “Cable Select” mode, the black cable connector plugs into the primary master drive, gray cable connector plugs into the secondary slave drive, and the blue connector attaches to the computer motherboard or host IDE controller. Once you have confirmed this important “master” jumper setting on the HD, then simply plug in one hard drive at a time to the DriveWire adapter and plug the USB cable into your USB port, and it shows up on your “My Computer” on a PC, or your desktop on a Apple Mac. You can copy and retrieve information from an old HD drive. That is the beauty of this plug-in device. Fast, easy to use, reliable, and really really handy too. Pictured below, from left to right is the Apricorn adapter, USB cable, AC cable which plugs into AC adapter, AC adapter with drive plug, and software disk with both PC and MAC software included. This device is great for IT departments, techies, and even the ordinary person that simply wants to easily plug in a hard drive to see what is on it. Check out the video on how easy it is to use. Here is a question from a reader in Internet land about his laptop hard drive. I have a question. I have a small laptop hard drive (dara-206000), 6GB ATA/IDE IBM Travelstar. I want to transfer all the data from this small hard drive to another hard drive with the same features. Does this universal hard drive adapter would work for me? It depends on how you intend to use it. 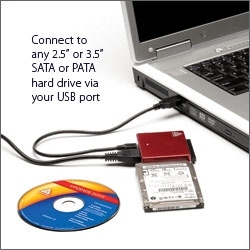 First off, if the hard drive is still in the laptop, then you need to have a USB 1.1 or USB 2.0 port available on your laptop to clone directly with the adapter to the computer’s internal hard drive. Then once you’ve done that, simply pull out the internal HD and replace it with the new higher capacity laptop drive. It’s important to note that the adapter is designed to only hook up one drive at a time to the output port of the adapter and then hook up the input to a USB port of a computer. The hard drive will show up as an external hard drive on the computer’s “My Computer” page for a Microsoft Windows OS PC or display on the desktop for an Apple Mac OS computer. 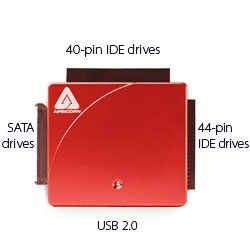 The Adapter is for SATA 2.5″ or 3.5″ Hard Drives and Parallel HDs, IDE 44 Pin Adapter, or IDE 40 Pin Adapter for Laptop Drives & Desktop Drives to USB 1.1 and 2.0 Interface. Hope that helps explain the details of how to go about transferring the HD information from one HD to the other. By-the-way, you could even use the Apricorn DriveWire adapter to clone to a solid state hard drive – SSD HD too. PS Learn more about quickly retrofitting to a SSD, Solid State Diskdrive in a laptop, notebook, and Apple & PC desktops too. Don’t make the mistake, before it is too late; backup your system now. And don’t forget to get your business discovered online with Internet marketing services from Professional Web Services today.